From the land of a thousand lakes, Amorphis returns with another melodic death metal album, ready to incite both singalongs and headbanging aplenty. My personal relationship with the band in question has been so-and-so over the years, as they have always just kind of ‘been there’. Lately, however, the band has become more and more consistent in delivering one rock-solid melodeath album after the other, and having heard several of the tracks from this latest offering, “Queen of Time”, even before it was released in May, I found myself a little intrigued as I queued up the entire record for further examination. 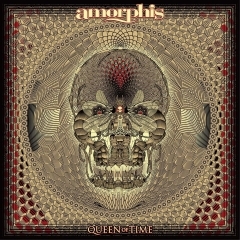 Starting off with “The Bee”, we have a very good example of what Amorphis do best: heavy riffs and harsh growls, but mixed with beautiful melodies, catchy hooks and a shift of the vocals in the chorus that presents lead singer Tomi Joutsen from a different angle, with his lovely clean singing. The band tend to shift the octave of both the guitars and the vocals in the choruses the second time around, as is also seen on “The Bee” around the 02:30-minute mark. This is a beautiful detail used in several of their songs — but definitely not excessively, mind you, even if Amorphis seem to operate around this structure all throughout the album. Granted, this can be viewed as either something negative or positive, but I’m leaning towards the latter, as I will try to explain in the following passages. Onto the next track, “Message in the Amber” starts off with an almost Nightwish-style intro. Apart from the muted, nigh silent verses, this song sees Joutsen fully utilize his growls during the chorus, which are both deep and raw. As a nice juxtaposition, the verse once again returns to the swift and silent verse, before erupting again in growls and double pedals, whilst always managing to sustain some of the catchy melodic hooks from the keyboard, choir vocals, and even a saxophone on “Daughter of Hate” to give it even more depth. Overall, Amorphis truly understand how to write melodic and catchy music, while still succeeding in giving it enough edge to make the songs stand out — as seen on “The Golden Elk”, where melodic hooks lure the listener in just to get barraged by deep growls. The listener is again rewarded in the chorus, which, almost as expected by now, sees Joutsen return to his fantastic clean vocals. Even though I say almost as expected, it doesn’t take anything away from this track or any of the others on the record, because they are simply just that well written. Every track highlighted here seems to have something special about it, whether it is the usage of Spanish guitar, the aforementioned saxophone, organ, flute or a special kind of keyboard sound. Not to mention the riffs present on this release; these need to be highlighted as well, as they are not just your run of the mill -type of melodic death metal riffs. They are inventive, catchy and vary to such a degree that they make the tracks so much better than they would otherwise be. 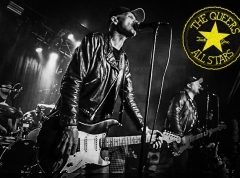 Even a sort of adventurous riff is witnessed on “We Accursed”; it’s grand and definitely meant to be played in front of a large crowd on a huge stage such as those found at the Danish Copenhell festival (hint hint). When the fifth track “Wrong Direction” arrives with yet another melodic hook in the chorus, one would think that I’ve had enough. This is luckily not the case though, because it once again highlights how brilliantly Amorphis compose their songs. The chorus is, simply put, so grandiose, and it probably wouldn’t be as epic if it had been executed without Joutsen’s brilliant singing voice. And even after the octave shift marks its return, I still find myself humming along to the track and even trying to mimic the line ”I should have understood…”. A final highlight must be made with “Amongst the Stars”, as this is quite possibly the best track on offer out of anything on “Queen of Time”. On this piece Amorphis have, after all, tried to mix things up with Anneke van Giersbergen of The Gathering providing guest vocals for the chorus, and I was simply blown away the first time I heard it. While this style is so far from the metal I personally usually like, if that chorus doesn’t give you even the smallest amount of goose bumps or make your head nod even a little bit, you must be stone cold dead. It is both insanely beautiful, but also very raw when Joutsen eventually chimes in with his harsh growls. One small downside must be mentioned regarding “Queen of Time” as well. With the two bonus tracks, the album clocks in at more than an hour, which is simply too much for my liking, and not even another well-written melodic death metal track by Amorphis can redeem that. However, there’s no doubt that the style of Amorphis is something of a guilty pleasure of mine, as it is very different from the music I tend to listen to. But when the melodies, hooks and riffs are as well-written and executed as the ones on this album, it should be rewarded equally. I wouldn’t count myself a bigger Amorphis fan after listening to this record, given that it ‘merely’ meets my expectations. I will, however, say that the songs present on “Queen of Time” should leave no fan of the softer variant of melodic death metal disappointed. 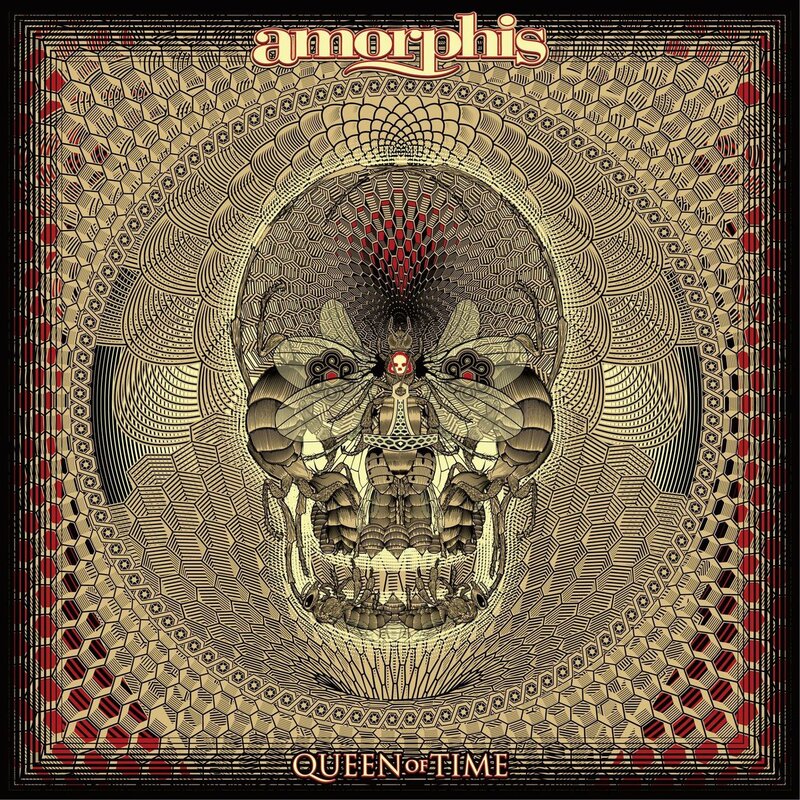 If Amorphis manage to grasp the elegant grandeur, vitality and stamina of “Queen of Time” in a live setting, it could turn out to be one hell of melodeath party!